Our most popular post is about questions with HOW. There is another post on all the WH question words. In this post I would like to deal with the questions starting with the word WHAT. To help you with this grammar there is a mind map and two games. The mind map shows the most frequent usages of the word WHAT in questions. What is most frequently followed by IS/ARE. Another possibility is, that it is followed by a NOUN. The most common nouns after the word WHAT are colour, kind of, sort of and time. And the third option is that the word WHAT is followed by DO/DID. There are three set phrases which you should learn by heart: What happened? What is he like? and What does she look like? 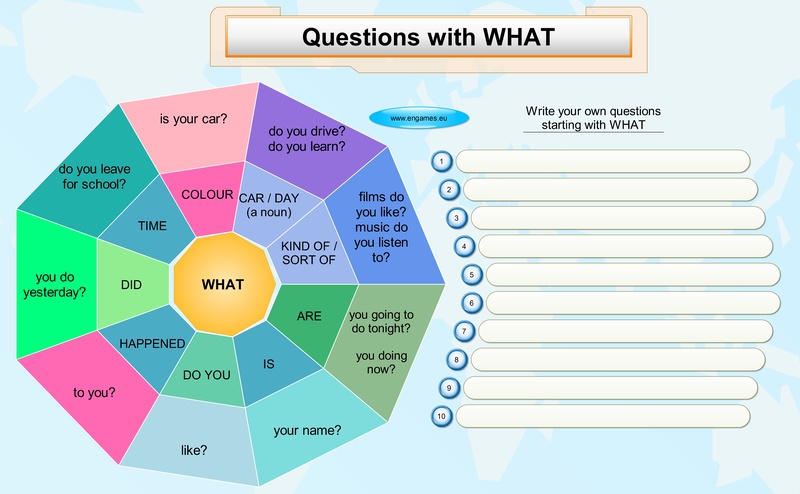 The mind map clearly shows the usage of the word WHAT and it is designed in such a way that it can be used as a worksheet too. Your task is to write 10 correct questions starting with WHAT there. The first quiz and game in one has been designed in HTML5 so you can play it on any mobile device or a computer. Your task is to answer the quiz questions and if you pass the quiz, the game Word boggle is waiting for you. Your task is to find in 30 seconds as many words as possible. The longer the word the more points you get. At the end you can share your score on Facebook or here in the comments section. Good luck. If you are using a mobile phone click here, to see it on the full screen.